As a young girl growing up in Albany, Georgia, Paula Deen never dreamed she would become an American icon. As a young mother, Paula was living the American dream—married to her high school sweetheart, raising two adorable boys—when tragedy struck. Her parents died, her marriage failed, and she began a prolonged battle with agoraphobia. With her boys in their teens and her family near homelessness, Paula took her last $200, reached deep inside her soul, and started The Bag Lady, a home-based catering company that marked the start of Deen’s professional cooking career. 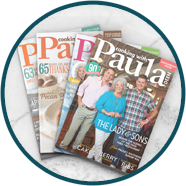 With sons Jamie and Bobby delivering “lunch-and-love-in-a-bag,” beginning in June 1989, Paula turned around her life by sharing what she knew best—traditional Southern cooking. Overcoming poverty, self-doubt, and health challenges to achieve success and acclaim, Paula has become one of the best-known personalities in the world of cooking. Yet the most remarkable part of Paula Deen’s journey from her kitchen to fame is that Paula has remained every bit as genuine, real, and full of love as she was the day the first meals left her kitchen. 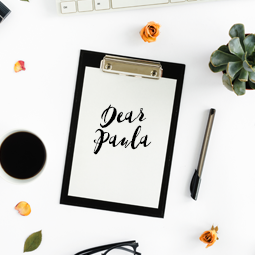 Since then, Paula’s business interests have grown considerably. In 2011, Paula Deen Foods was launched and in 2013, they introduced food products developed in Paula’s kitchen and based on both her traditional recipes and lighter versions. In 2014, Paula launched her nationwide live tour, Paula Deen Live!, which consisted of 90-minute shows featuring Paula making her favorite seasonal dishes. She also played fun, interactive games with her fans and shared stories on stage with her husband, Michael. 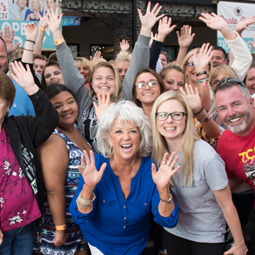 For the first time ever, fans had the chance to interact with Paula personally and sample her delicious Southern creations. 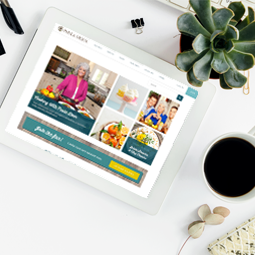 In 2015, Paula launched her free mobile game, Paula Deen’s Recipe Quest; premiered her first show on EVINE; and launched her podcast, What’s Cooking with Paula Deen, and radio show, Get Cooking with Paula Deen. That year, she also launched her own line of dog food called Paula Deen Hugs Healthy Adult Dog Food. In the fall of 2015, Paula released her cookbook, Paula Deen Cuts The Fat: 250 Favorite Recipes All Lightened Up, which reached The New York Times Best Sellers List in under a week. Simultaneously, she competed in the twenty-first season of ABC’s hit show “Dancing with the Stars,” and successfully made it halfway through the competition. Her upcoming book, At the Southern Table with Paula Deen, features 150 classic recipes, perfect for sharing with friends and family. 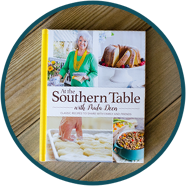 At the Southern Table with Paula Deen will be Paula’s 18th book. 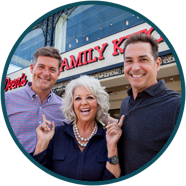 Since 2015, Paula has opened four new restaurants, including Paula Deen’s Family Kitchen in Pigeon Forge, Tennessee, and Myrtle Beach, South Carolina; Paula Deen’s The Bag Lady in Pigeon Forge, Tennessee; and Paula Deen’s Creek House in Savannah, Georgia. 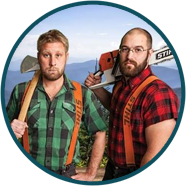 In the fall of 2016, Paula launched two new television shows, Positively Paula and Sweet Home Savannah. 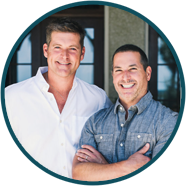 Positively Paula, a nationally syndicated show, welcomes fans into her personal kitchen while she cooks, shares stories, and visits with family and friends. 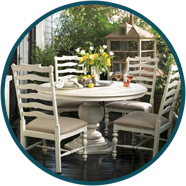 Sweet Home Savannah on EVINE invites Paula’s fans into her Savannah home each week for a live, two-hour show, filled with her fashion, kitchen products, and home textiles. Ever grateful for all she has been blessed with, Paula and her family continue to give back to the community. Paula, a board member of the Bethesda Home for Boys, also works tirelessly for America’s Second Harvest. In 2012, Paula launched The Bag Lady Foundation, supporting issues of hunger that affect women and families across the country.